around the leg to boost your physical performance. The Honeycomb is a geometric structure that appears in many natural and handmade systems. enhancing the pressure evenly throughout Native Planet's compression sleeve. high 3D force-per-area stresses and ramp its damage tolerance. increasing the body's performance and deterring odors. but also allows air to flow freely in and out. * The only sleeve that employs a naturally compressive structure. * 3D Hexagonal force-per-area stress. * Moisture wicking, breathable fabric. * Prevents skin bacteria accumulation. * Comes in a variety of colors and styles. Its All About The Design - The new Native Planet Honeycomb is the first compression sleeve to use a hexagonal fabric structure that increases blood circulation into the muscles around the calf area. A naturally occurring formation, honeycombs exert a strong out of plane compression force while being extremely material efficient and thus very lightweight. You will not be able to feel its there! Boost Your Performance & Stay Strong - Compression sleeves create a graduated compression effect, which improves leg energy conduct and stability. When compressed, veins far from the heart produce a higher blood flux which results in an increased oxygen exchange in the muscles, propelling more power to the legs and supporting the muscles for maximized stability during technical training. 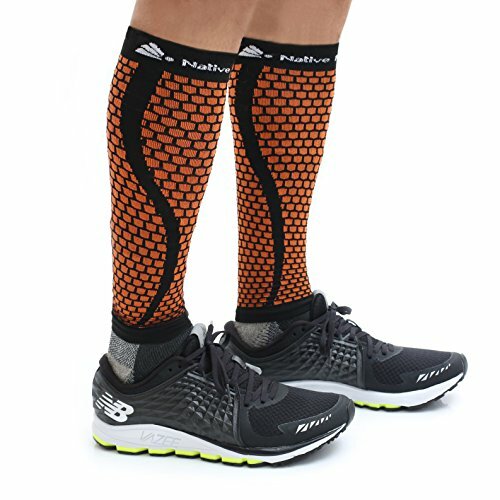 Reduce Injury Risks & Avoid Shin Splints - Our honeycomb compression sleeve was designed to help alleviating shin splints and to expedite muscle recovery. You will sense a reinforced support that will reduce the chance of injuries not only in the front shin area, but also in the back calf and Achilles tendon. More physiological effects such as reduced muscle fatigue, faster warm ups and recovery from tough trainings will also occur while using our sleeves. Stay Dry & Oder Free - using a spontaneously moisture wicking fabric and a honeycomb sewing technique with an enhanced shear stress component which transports all sweat away from your skin, you can enjoy a cooler, breathier and drier workout. The lack of moisture on the skin prevents bacteria accumulation and keeps the odor away. We also added anti odor fibers so the stank will be completely eliminated and the sleeves can be used many times in a row. Comfort Is The Key - In the end of the day, athletes want the prevent injuries, boost their performance WHILE feeling as natural as possible. Native Planet's Honeycomb is the only compression sleeve that actually delivers that. Our fabtic is extremely thin with no ribbing areas or annoying vertical stitched lines. It also sports an uncompromising durability & strength thanks to its hexagonal properties that allow it to withstand high 3D force-per-area stresses and ramp its damage tolerance. View More In Compression Sleeves. If you have any questions about this product by Native Planet, contact us by completing and submitting the form below. If you are looking for a specif part number, please include it with your message.